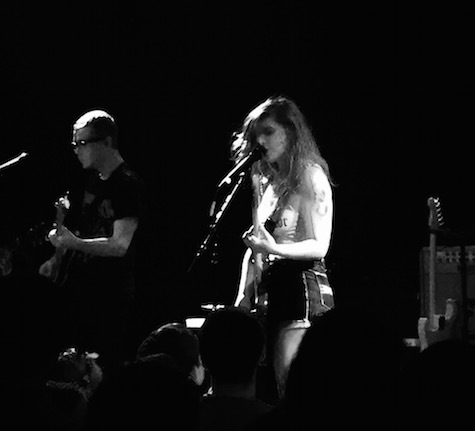 Best Coast at The Waiting Room, June 9, 2015. If this review seems light on the bands that played later in the evening it’s because I only went to The Waiting Room last night to see the opener, Bully — a band that’s getting a bit of a buzz lately — and not co-headliners Unknown Mortal Orchestra and Best Coast. I knew virtually nothing about UMO; never listened to a single track from the band prior to last night. And yet for a few people I’d talked to, they were the main attraction on the bill. When you go into a show knowing nothing you expect even less, which is what I got from UMO. Though they’re compared to Tame Impala and MGMT, they sounded like a noodling jam band to me with a tip o’ the hat to beachy Jack Johnson. Not my bag, but unless my eyes deceived me, the crowd peaked during their set so they must be doing something right. After three or four songs I found myself paying more attention to the score of the Cavs/Warriors game on my iPhone than the stage, so I hightailed it down to St. Andrew’s to catch the last five minutes of the 4th quarter (which stretched out to 15 in real time), where I saw a few more show ex-patriots waiting out the UMO set. BTW, who knew that Lebron James and the Cavs were so loathed? Made it back to The Waiting Room in time for the start of Best Coast. I don’t know if it’s an endorsement of the band or an indictment of SXSW, but Bethany Cosentino and Co. were on point last night, playing way better than when I saw them in Austin in March, where they looked bored as if fulfilling a commitment (which they were). Last night they were into it, ripping through one song after another, Cosentino’s long hair (along with sideman Bobb Bruno’s) floated ethereally alongside her head, blown skyward by electric fans Cosentino said they were trying out for the first time on tour. Whereas I liked Best Coast’s energy, the band did little more than play through their set list, which isn’t enough to keep me engaged, especially since I don’t own any of their albums. 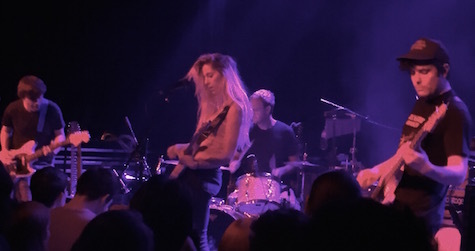 Bully at The Waiting Room, June 9, 2015. On the other hand, I knew nothing about Bully prior to last night and left a fan (or at least entertained). The band is centered on frontwoman Alicia Bognanno, whose high, sometimes-scratchy vocals border on novelty. In fact, Bognanno’s voice would be perfect for the role of a cute woodland creature in an animated TV show; something tells me she does a spot-on impression of Bart Simpson. More often when she’s singing, however, Bognanno channels Kurt Cobain on music that is straight out of 1992. Is there a grunge resurgence going on (already)? Bully’s songs, especially during the first half of the set, sounded like they could have been written by Cobain (or Courtney), thanks to their bass/rhythm lines, the loud-quiet-loud dynamics and Bognanno’s howl/screech that was pure Teen Spirit. Bognanno was at her best when she throttled down the howl and simply sang. Toward the end of the set she introduced a song saying she was “slowing it down” and getting all “romantically.” The tune was pulled back, controlled, but took flight toward the end, and was the best song of the night (by any band). Bully’s debut LP comes out June 23 (a crowded date for releases). Where will they go next? Seems like a decade ago that I interviewed Metric, because it was. The band has done nothing but grow since then, winning a handful of Juno Awards, which is sort of the Canadian version of the Grammy’s. Thanks to this success, Metric is now placed as an opener for arena shows, like the Imagine Dragons show tonight at the CenturyLink Center. Needless to say I won’t be attending, but felt compelled to mention it as Metric played at Sokol Underground once upon a time. A show I’m more apt to attend is Street Eaters tonight at Sweatshop Gallery. Chris Aponick of Perpetual Nerves, the company promoting the show, described them as “a two piece that plays noisy stripped down rock that steers clear of garage rock’s worn out tropes.” Also on the bill are Navy Gangs, CJ Mills and Our Lady of Perpetual Help. $7, 9 p.m.
By the way, they don’t call it “Sweatshop Gallery” for nothing. It will be hotter than hell in there tonight. You may want to show up in your skivvies.